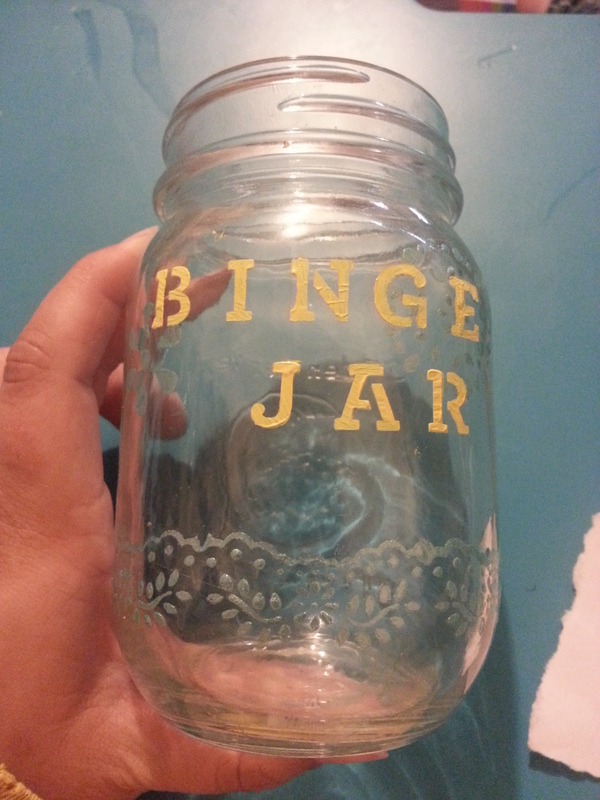 I have finally taken the time to sit down and create a binge jar (a.k.a. the Anti-Binge Jar, or Instead of Binging Jar)! It really took me forever to get around to, since I had a specific idea for how it should look in my head, and I didn’t have the time to sit down and do it (or so I thought, honestly it didn’t take too long at all). So, what IS an “Instead of Binging Jar”? For me, it’s a jar that has ideas about what to do instead of stuff my face out of sheer boredom or because of negative things happening in my life. I am a really emotional eater. I eat because I get nervous, I eat if someone gets mad at me, I eat because I’m lonely, whatever. If I could get over being so awkwardly shy around people, I would probably naturally eat less… but, that’s another matter entirely. 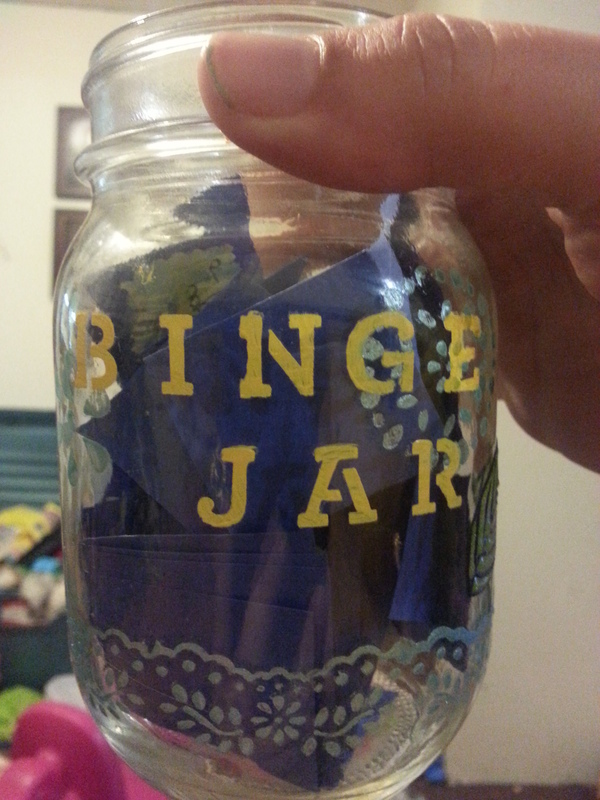 My binge jar contains 27 different ideas of things for me to do INSTEAD of pig out. It’s just that simple. As an added twist, to further my attempts to not eat massive amounts of food, I added a rule. 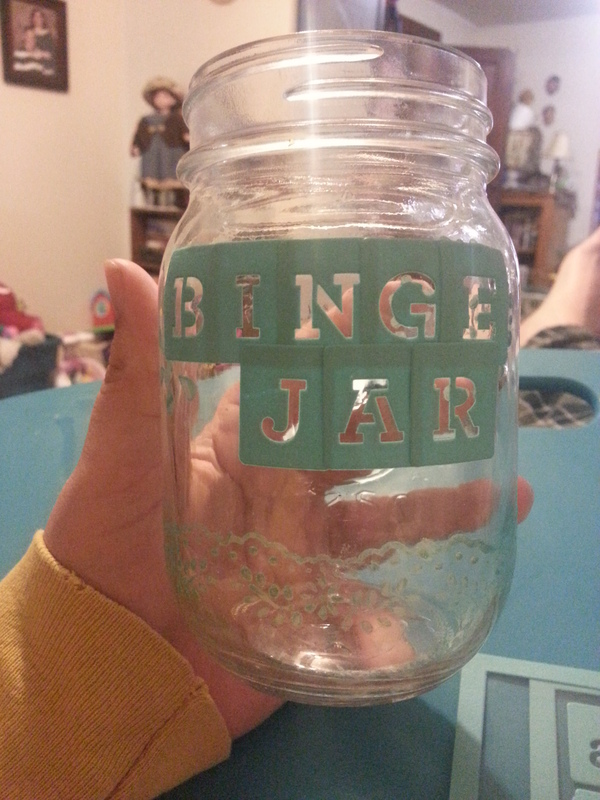 If I do binge, ever… I owe my jar $5. Every single time. The money will be saved and used to purchase sports or health equipment, so it is a good cause, but I think actually losing the money temporarily will help. (So far it has!). #27 is also a play on this, it’s always a risk putting your hand into the binge jar, because I only want to use it if I really can’t fend off the urge to eat by myself, I can pull a tag that means I automatically owe the jar $2, and still have to pick another activity. Just a little additional motivation :). Some good ideas for your binge jar would basically be anything that involves using your hands, therefore making you unable to use them to eat, anything that takes you out of your house (but not in the area of take-out), something that occupies your mind so that you’ll forget about the popcorn you thought you were craving. Things that usually aren’t good ideas are sedentary activities where your hands are free to get that food into your mouth. I wanted something pretty to look at, since this isn’t an entirely pleasant idea in general. No one wants to clean instead of stuffing their faces, BUT, cheering me up and having something pretty should help with this. I chose a paper from one of my scrapbooking kits that I loved and decided to use it for all of my tags. 5. Go for a calming walk or jog. 11. Send a note to someone you haven’t spoken to in a while. 12. Work in my smashbooks. 15. Write some positive things on sticky notes and post them around town. 21. Do some budgeting work. 25. Go online window shopping. 26. Write a blog post. 27. Add an additional $2 to the money jar, AND choose another idea. Then I cut them using a cute pattern, and then glued them onto a larger sheet of scrapbooking paper to make them a little more sturdy. Cut up the ideas, fold them up, and place them into the binge jar. The only additional thing that I’m going to so is put a little fabric on top instead of the normal mason jar seal as my lid, to fancy it up a little more. Got any suggestions for things for me to write about? Let me know. Drop me a line and I’ll do my best. « There’s a party in my future.